Red Dead Redemption 2 has took the gaming world by storm, for good reason. With over sixty hours of gun-slinging shenanigans immersed within a story that’s thrilling and compelling, it’s enough to send any gamer into a square-eyed stupor. There’s many, many elements to discover when exploring the enormous map, and I believe I’ve seen enough to give specifics on some of my favourites, which happen to be the horror-esque Easter eggs sprinkled throughout. Please note that there will be spoilers. Pretty ominous masks – such as the Executioner Hood, Canvas Sack Mask, Metal Skull Mask and Psycho Mask – can be purchased from any fence, however there are various ghastly creations to collect throughout the world. Not only do they hide your identity when committing crimes, they instil fear in the hearts of your victims! 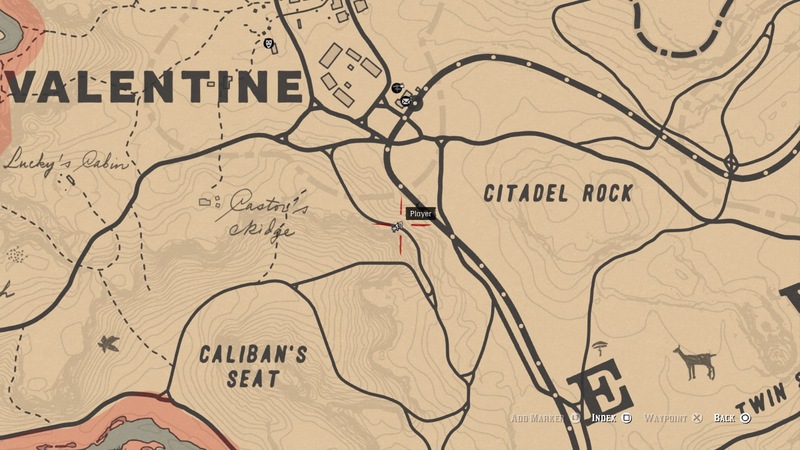 Location: West of Strawberry, near the very edge of the map. Details: Loot the mask off the corpse impaled upon a spike, in the middle of the ritual circle. Location: Lakay, north of Saint Denis. 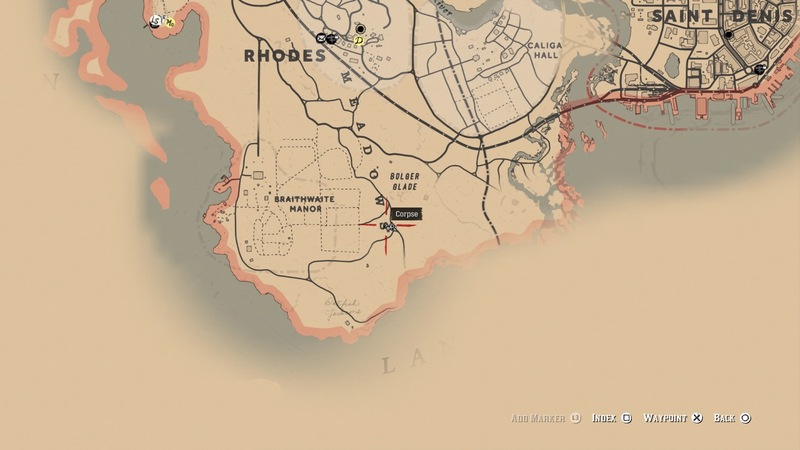 Details: Loot the mask from the very back on a hut that’s sinking into the water. Location: Butcher Creek, northeast region of Roanoke Ridge. Details: Loot the mask from the hanging pig at the butcher’s stall. Find more in-depth information relating to these objects here. Images are not my own. Side-quests are common when out adventuring, however none are quite like discovering gruesome murder scenes and following the clues of a deranged killer. A total of three corpses can be found, all displayed in such a way that portrays one twisted individual, with the messages: “Do you see”, “Look on my works” and “Behold”. Scene 1: Just south of Valentine. Scene 2: Southwest of Wallace station. Scene 3: Southeast of Rhodes. Putting all three pieces of the puzzle together will lead to a location. I won’t spoil it entirely, because it’s just something I feel should be experienced first-hand. Find more in-depth information relating to this quest here. Images are not my own. Not exactly horror? Well, my personal encounter with the UFO was definitely frightening. 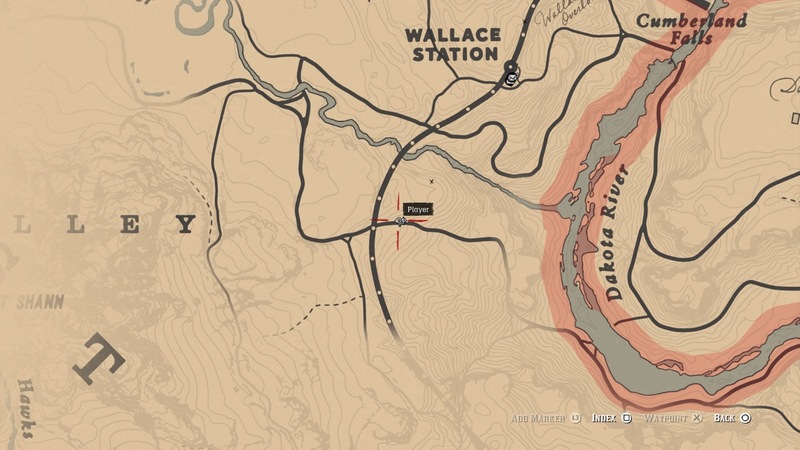 There’s a decrepit shack north of Emerald Station in New Hanover, and within it are several skeletal corpses in beds. There’s a note, a very interesting one concerning time, galaxies and a saviour. It mentions “the second hour”, and so when returning at two o’clock in the morning, the shack will be bathed in a otherworldly glow from what can only be a hovering spaceship. A second UFO can also be discovered atop Mount Shann, located to the north of Strawberry, in the centre of Big Valley in West Elizabeth. There’s also various other evidence depicting the worship of alien beings. Find more information relating to this topic here. Image is not my own. It’s not all too easy to come across this bloodsucking fiend, as it requires finding five pieces of writing in the back alleys of Saint Denis. The effort is worth it though, who doesn’t want to fight a vampire? Location 1: The building opposite the northeast saloon. Location 2: Beside the trapper area. Location 3: Near the butcher and general store, facing the dock. Location 4: Southeast of the gun shop, in the alleyways. Location 5: Southwest of the gun shop, also in the alleyways. After inspecting all five, the encounter will trigger. Of course, it can only occur at night, and it’s damn atmospheric. Find more in-depth information relating to this topic here. Images are not my own. There’s also ghosts (like the ghost of Bluewater Marsh), wild swamp people and a slew of other oddities and surprises to discover. There’s even mysteries that have yet to be solved. I certainly haven’t seen everything, nor will I ever, probably. What are your favourites? Have you found something not listed here?